Maps have been used for thousands of years, but it is only within the last few decades that the technology has existed to combine maps with computer graphics and databases to create geographic information systems or GIS. The themes in the above graphic are only a small example of the wide array of information that can view or analyze with a GIS. GIS is used to display and analyze spatial data which are tied to databases. This connection is what gives GIS its power: maps can be drawn from the database and data can be referenced from the maps. When a database is updated, the associated map can be updated as well. GIS databases include a wide variety of information including: geographic, social, political, environmental, and demographic. GIS uses layers, called "themes," to overlay different types of information, much as some static maps use mylar overlays to add tiers of information to a geographic background. Each theme represents a category of information, such as roads or forest cover. As with the old mylar maps, the layers which are underneath remain visible while additional themes are placed above. With the belief that these sophisticated technologies should not be the province of a privileged few, Mapcruzin provides free GIS resources, free GIS maps, a free GIS tutorial that uses a free gis program, and several low cost products, including our Indian and Federal Lands Maps, Toxic Facilities Maps (now FREE also). Also, check our GIS Explained page to learn more about the terminology of GIS and digital mapping. It is estimated that approximately 80% of all information has a "spatial" or geographic component. In other words, most information is tied to a place. So when making decisions about siting new facilities, creating hiking trails, protecting wetlands, directing emergency response vehicles, designating historic neighborhoods or redrawing legislative districts, geography plays a significant role. This is where GIS comes in. 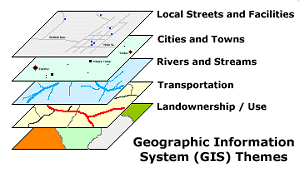 Geographic Information Systems (GIS) technology is a computer-based data collection, storage, and analysis tool that combines previously unrelated information into easily understood maps. But GIS is much more than maps. A GIS can perform complicated analytical functions and then present the results visually as maps, tables or graphs, allowing decision-makers to virtually see the issues before them and then select the best course of action. Add the Internet, and GIS offers a consistent and cost-effective means for the sharing and analysis of geographic data among government agencies, private industry, non-profit organizations, and the general public. Our GIS of Choice is Maptitude and here's why.